Since it was given to Congress in 1829, the Smithsonian has become the world’s largest museum and research complex with 19 museums, the National Zoo and nine research facilities. The “Collections Blog” rounds up the Smithsonian’s archivists, museum specialists and librarians to write about their new collections, current works in progress or whatever catches their eye. 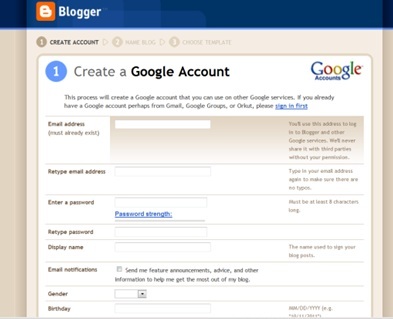 It looks like the blog was launched fairly recently in 2010. 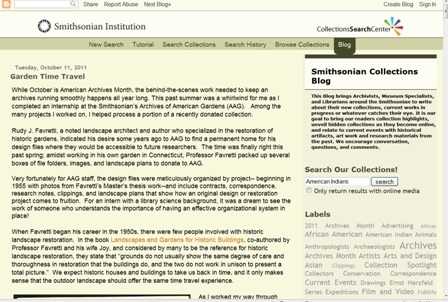 You can access the blog from the Smithsonian Institution Research Information System (SIRIS) at http://www.siris.si.edu or from the Collections Search Center at http://collections.si.edu. The Design seems to be pretty basic, with the latest blog post taking up most of the layout. On the right is a search bar and a word cloud of links to popular search terms. I’d say mostly adults, because the last few posts were about typically adult (18 and over) subjects like historical gardens, Ernst Herzfeld’s 1911 excavation of Samarra and faux vintage photography. 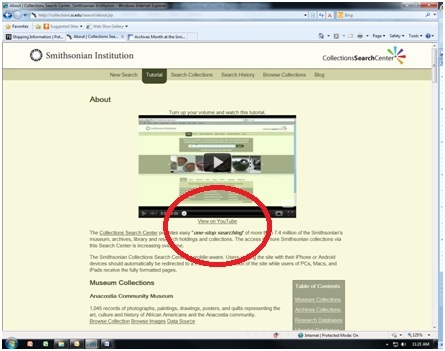 It is their goal to deliver collection highlights, unveil hidden collections as they become online, and relate to current events with historical artifacts, art work and research materials from the past. They also hope to encourage conversation, questions and comments. 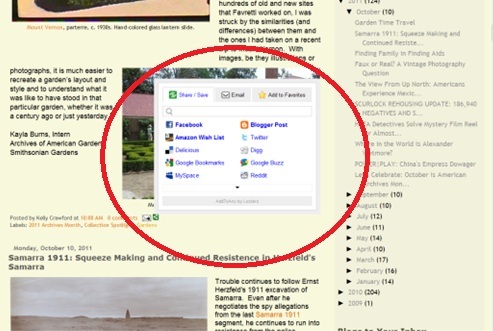 Although this blog does not overtly reference Facebook and Twitter, it does list all the other blogs of the Smithsonian on the right-hand side of its homepage. Apparently, October is “American Archives Month,” which is meant to showcase the importance of the Smithsonian’s vast collections of archival and historical records and to highlight the many individual Smithsonian archival units responsible for maintaining these rich and complex documentary resources. 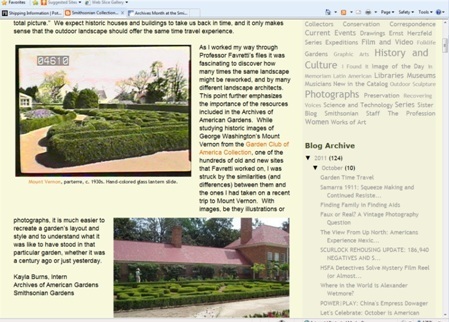 I found several commentaries on blogs referencing posts from the Smithsonian Collection’s blog. They generally seem to be positive. One commentary by an “an anthropologist with an unusual love for museum collections and an idealistic faith in the potential of digital museum catalogs as something that could give collections more life” said the blog was “quite refreshing” on August 2, 2011 (http://artefakter.wordpress.com/2011/08/02/smithsonian-collections-blog-pop/).